New one piece design made from 3/16" steel with 1/4" winch mount and mounting arms. Great approach angle, reinforced corners, 3/4" thick D-ring mounts. Powder coated black or order it bare and save some cash. Fits 84 thru 01 XJs. 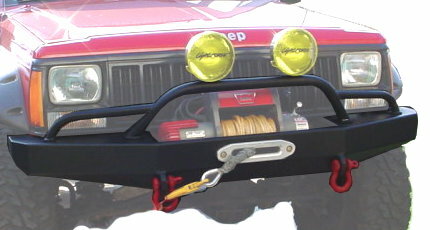 Package includes bumper, PreRunner bar, and 2 D-rings. (lights, winch, and fairlead not included). Bumpers are built to order, please allow 3-4 weeks for delivery.